When bees are mentioned many people think of the Bumblebee. Their furry bodies, 'football jersey' striped coats and bumbling flight make them easy to recognise. Many think that these are kept in beehives. Nothing could be further from the truth. 'Queen' bumblebees hibernate as seperate individuals, having mated the previous autumn. These queens are large and fly about in the spring looking for nesting sites, ranging from disued mouse or bird nests to a composte heap. There they rear their first offspring which are very small compared to their mother. It is not obvious that the large queen and the small offspring are the same species. From then on in its life cycle, the bumblebee is social i.e. they live together. With help from her brood, this queen will rear the next batch of worker bumblebees, which are larger. The colony will then grow in numbers, which will never be larger than a few hundred. During late summer and autumn, bumblebee nests produce fully fertile males and females. These mate and the fertilised females hibernate until the next year. Bumblebees have a sting but very rarely use it. As an Association, Wimbledon Beekeepers' is unable to deal with nests of Bumblebees. Our advice is to try and live with them as they will nest in a different place after one season. Masonry bees are normally harmless, their sting seemingly unable to penetrate human skin. Unlike honey bees these are solitary insects. They nest in a wide range of cavities some of which they excavate themselves. The nest particles are glued together with saliva. On occasions masonry bees can present a problem due to their ability to build nests by tunnelling through soft brick mortar, generally in older properties. Only rarely do large numbers occur together but due to the fact that vulnerable buildings tend to be repeatedly attacked, quite severe damage can occur over several seasons. Modern houses are not immune either. Small gaps left in otherwise sound mortar may be colonised. Although this is not a problem from a structural point of view, some householders are distressed by such activity. In the long term, re-pointing with sound mortar is the only answer. This must be thorough however, as bees hunting for a nest site will soon locate areas that have been missed. Small individual holes are easily filled. As an Association, Wimbledon Beekeepers' is unable to deal with Masonry Bees. Swarming is the natural means of reproduction of honey bee colonies. In the process two or more colonies are created in place of the original single colony. It is considered good practice in beekeeping to reduce swarming as much as possible by several techniques, as allowing this form of reproduction often results in the loss of the more vigorous division, and the remaining colony being so depleted that it is unproductive for the season. Beekeepers control reproduction by making nucs (nucleus or starter colonies) or by shaking package bees (usually for sale) from hives in the spring before the natural swarm time. New honey bee colonies are formed when queen bees leave the colony with a large group of older worker bees, a process called swarming. The first or prime swarm generally goes with the old queen. As soon as the swarm is established as a new colony, the bees raise a new queen, or sometimes a replacement virgin queen is already present in the swarm. 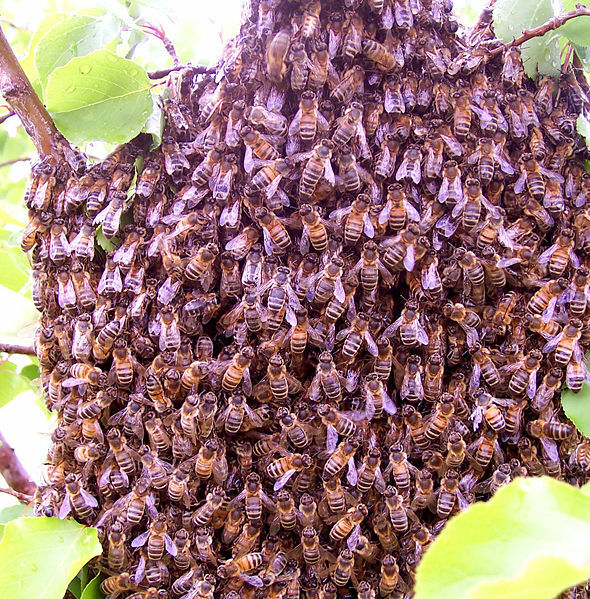 Afterswarms are usually smaller and are accompanied by one or more virgin queens. Sometimes a beehive will swarm in succession until it is almost totally depleted of workers. Swarming is mainly a spring phenomenon, usually within a two- or three-week period, the usual period depending on the locale. But occasional swarms can happen throughout the producing season. Old fashioned 'laissez-faire' beekeeping depended upon the capture of swarms to replenish beekeeper colonies and early swarms were especially valued. Swarms of bees sometimes frighten people, though they are usually not aggressive at this stage of their life cycle. This is mainly due to the swarming bees' lack of a hive to defend and are more interested in finding a new nesting point for their queen. This does not mean that bee swarms will not attack if they perceive a threat; however, most bees only attack in response to intrusions against their hive. Most swarms will move on and find a suitable nesting location in a day or two. Beekeepers are sometimes called to capture swarms that are started by feral honey bees or from the hives of inattentive beekeepers. 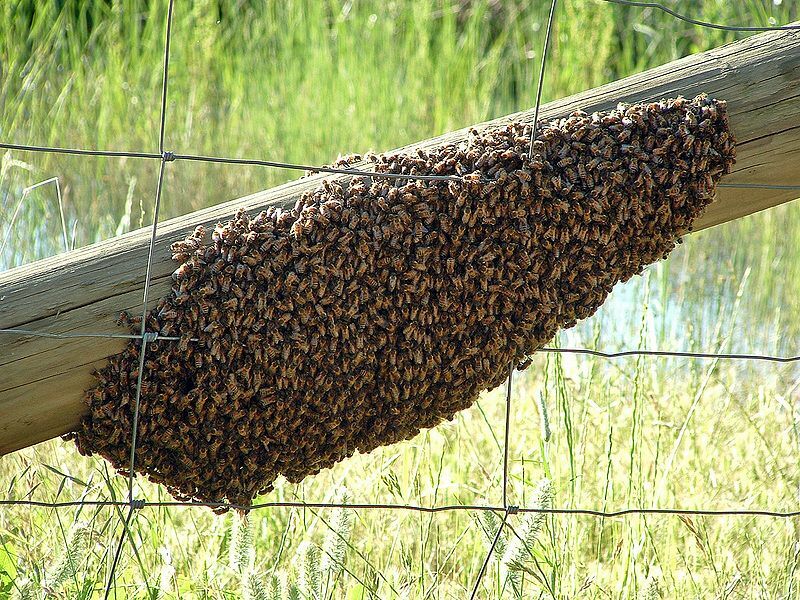 When honey bees swarm from the hive they do not fly far at first. They may gather in a tree or on a branch only a few meters from the hive. There, they cluster about the queen and send scout bees out to find a final location. From this first rest stop, a swarm may fly for a kilometer or more to the scouted out location. If you find a swarm contact your local council's Environment Officer, or local Police Station, who will arrange for a qualified Beekeeper to give suitable advice for the safe removal of it. Please note that we are unable to deal with Wasps, Bumblebees or Masonry Bees.